• The current food security situation is minimally food insecure. 60-80% of households are able to meet the basic food need due to stock from normal winter crop harvest and recently harvested summer crops. Production of main summer crops like millet and paddy is increased by 20% and 4.55% respectively but production of buckwheat is decreased by 20% compared to last year in cluster A & B. Besides this production cash crops, green vegetables and fruits is normal except potato. Production of potato decreased by 33% compared to last year. • The prevalence rate of acute malnutrition is maintained at 10% due to awareness created by different GOs and NGOs, School feeding programme and Child Nutrition Programme. • Houshlods have food stock sufficient for >4 months in cluster A and up to 4 months in cluster B. This is because of summer crop harvest and remained stock from winter crop harvest. Also Chinese government has granted 25-50 Kg of food per HH to 4 VDCs of cluster A and 2 VDCs of cluster B. The sell and distribution of NFC food is done in regular basis in DHQ.The VDCs of cluster A have easy access to main market in Chinese border side. The stock of main staples in DHQ and seasonal markets remained normal due to smooth and regular transportation by airlift and surface level. • The price of NFC rice is increased by 5% and wheat flour (Maida) by 10% compared to last year. Wage employment opportunities are as per normal situation in cluster A because of tourism, construction of buildings and casual works like pottering of NTFPs and timber woods. But the opportunities of employment is decreased by 10% in cluster B due to CA election. Income from sell of NTFPs like Jatamasi, Kutki, Wild garlic,Satuwa and Attis is also normal in both clusters. Earning from sell of those NTFPs is estimated as NPR 15000-20000 per individuals who were involved. Few HHs from cluster A Iand B were able to make good income by selling of livestock product and honey. Likewise few HHs have good income from sell of cash crops like potato, apple and beans in some VDCs of cluster A & B(i.e surrounding VDCs of DHQ). The flow of remmitance is very nominal in both clusters ( about NPR 800000). • There are no incidences of disease and epidemics recorded. Only 8 VDCs were declared ODF and water supply and sanitation system needs additional support or alternative means to fix. • Also no climatic hazard and disaters were occurred and the out-migration trend is normal except few traditional migration to Chinese border side for business purpose. HHs are adopting normal type of coping strategy like sell of cash crops, small business and wage labor in both the clusters. The civil security situation is normal due to peaceful and calm political situation. • The overall food security outlook will be deteriorating in cluster .Because the current households food stock will be running out and no new harveting in upcoming cycle. But the outlook in cluster A will remain the same because these VDCs are traditionally food secure and HHs have more food stock than cluster B. 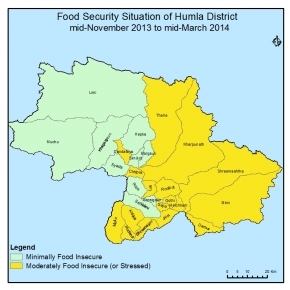 The most of the HHs of cluster A VDCs have the trend to keep food stock beforehand before the closure of Chinese border. • Access to main market i.e. Taklakot in Chinese border will be disrupted due to cold weather (For cluster A and B). Transportation of food commodities to DHQ and seasonal market (Paima) will be affected due to snowfall. So the stock of main staples in DHQ and seasonal market (Paima) is likely to decrease in up-coming cycle. • There will less opportunity of wage employment due to less presence of development activities. Also next monitoring cycle will be lean period for sell and collection of NTFPs and cash crops. The civil security situation will remain calm and peacefull.